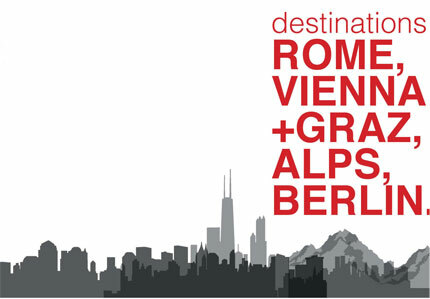 The Department of Architecture and Interior Design is organizing an exhibition for its traveling studios to Rome, Vienna and Graz, Berlin and across the Alps which took place in summer 2012. The 2012 DAID’s traveling studios took place in three of Europe’s major cities and across the Alps. LAU students, accompanied by their instructors , followed packed itineraries that immersed them in the outstanding richness of their architectural environments spanning the academic and professional contexts to the built forms themselves. The upcoming exhibition and talk will present the findings and ideas that the studios experienced before, during and after the visit to Europe.